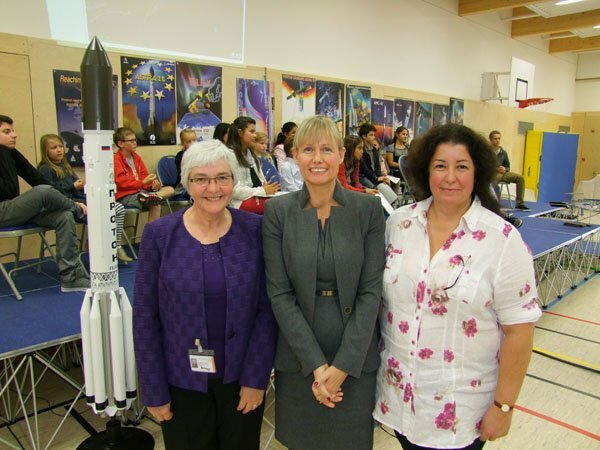 St George's had the pleasure of speaking with the astronaut Sunita Williams on Monday afternoon. Our local mentor was Florio Dalla Vedova, supported by Ariss radio mentor Gaston Bertels in Brussels. Radio links were done with Montgomery, Illinois with final link in Santa Rosa, California. There were 20 children and 20 questions asked. Ten of the children were from the Primary section of our school, while the other 10 came from the Secondary section. Their ages ranged from 6 to 15 years of age. All questions were successfully asked by the children and answered by Ms Williams. In the school gym, were approximately 200 people comprising of 130 children from all the different year groups of the 2 sections of the school and 15 teachers and other staff, also from both sections of the school. As the gym could not legally accommodate more than the number mentioned above, a “live stream” was organised by our IT technician, with the help of Edy Krier (the cameraman) and transmitted into the classrooms of the school. This enabled the other 500 students at St George's (both Primary and Secondary combined) and the 80+ staff to watch the event. There were no parents in attendance due to numbers, but DVDs of the event will become available to those interested, particularly the parents of the 20 children involved directly in the contact. In the audience were the UK Ambassador Alice Walpole, the Head Teacher Heather Duxbury and the Deputy Head Teachers (Kath Griffiths and Mark Stenton) of both sections. Geoff Thompson, a local journalist, photographed and interviewed the lead teachers, visitors and myself as did Edy Krier. (see link for Chronicle.lu). All was filmed by Cayenne TV (Edy Krier) who then broadcast the event on Luxembourg television the following evening (7pm, Tuesday Oct 9). Other magazines and journalists were notified, but due to the late notice and time (exact time given only 6 days prior, (with a weekend in the middle) with exact date given 2 weeks) it was very difficult for more to attend. But, in exchange many parents, staff and students have been talking about the event on Facebook as well as emailing the taped contact to friends and colleagues in faraway places around the globe. As for Space: the whole of Primary has and is dedicating this first part of the school year (until November) to all topics related to space, such as light and dark; gravity; flying; astronauts and so on. All art classes have used Space as their central theme. In Secondary, the science teachers have included topics related to Space into their program as much as the curriculum will allow. 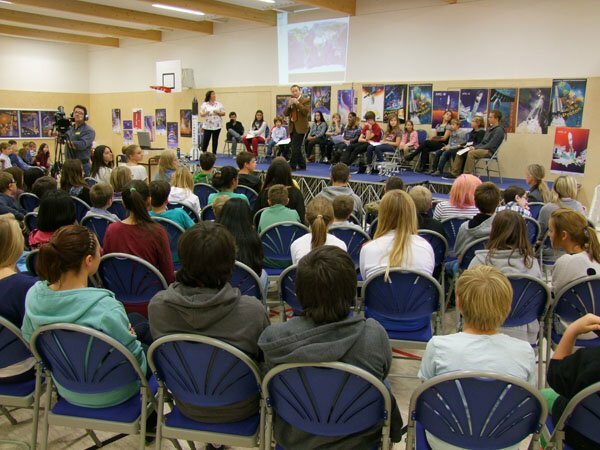 Other points of interest have been invited guest speakers to the school: Ralf Heckel from the International Space Education Center in Leipzig came and spoke about the NASA’s Moon Buggie project. Dr Jeroen Buursink of LuxSpace gave a talk about satellites. Also programmed to come in the near future is Florio Dalla Vedova, also from LuxSpace, who will be speaking about amateur radio. 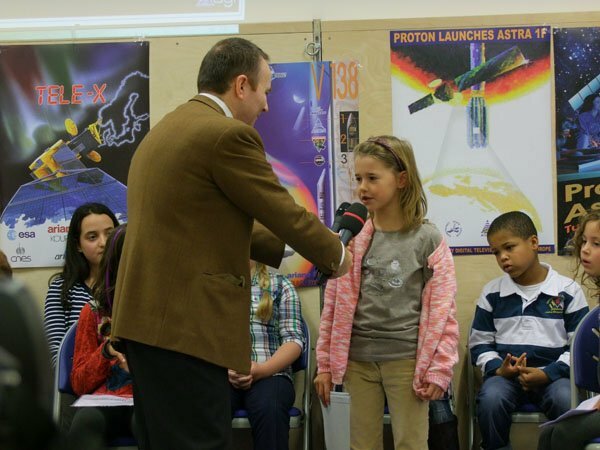 Astra SES provided the audience and the speakers in the gym with a small gift (a little satellite model), small posters and stickers as well key chains for the whole school. Posters (on display in the pictures) were also donated to the school. Various models of the Proton rockets are currently on loan. A parent donated a 1/130 scaled model of the ISS to St George's. The general comments about the contact was overwhelmingly : how emotional, it was fantastic, how amazing to actually speak to an astronaut, fantastic, incredible, many many thanks for all the hard work and effort into making this happen for us, and so on. The parent responds have also been quite amazing, with many commending the school for such an incredible project. It has and still is the main conversation piece on the school grounds and in Facebook.